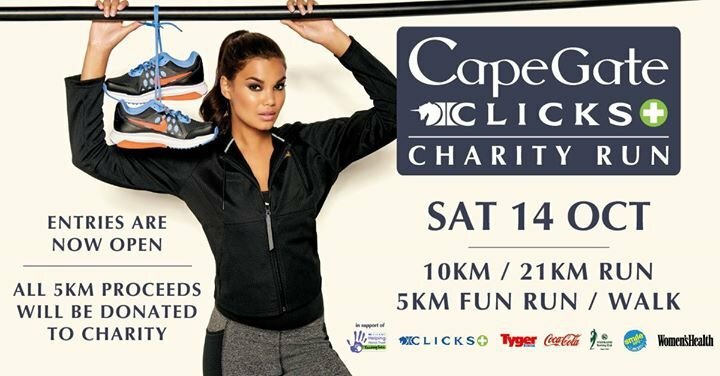 Bring your family, friends and colleauges and join us at the annual Capegate Clicks Charity Run on 14th October 2017. All proceeds from the 5km entries will be donated the the Clicks Helping Hands Trust. Registration will take place in centre court at Capegate Shopping Centre on 12th & 13th October from 18h00 - 20h00. New entries will also be taken on the day between 05h30 - 06h20. The prize giving will commence at 09h45 at the finish mark (Pick 'n Pay entrance). There are load of spot prizes to be won, great entertainment including a Pound class demonstration and a free perfomance by Chad Saaiman! Not to mention over R70,000 in winning cash prizes to be given away to the first places in the 10km and 21km distances. * Please arrive early to avoid trafic congestion and park on the lower level open parking (entrance 3 or 4) or undercover parking opposite Capegate Mediclinic. * Pets and prams are welcome to join in the 5km fun run and you can win prizes for the best dressed! * Goodie bags will be given out to the first 3,000 runners that cross the finish line. * If you're doing the 5km fun run, don't miss the warm up presented by Women's Health at 7am. Clicks, Peninsula Beverages, Smile FM, Women's Health, Tygerburger and managed by the Nedbank Running Club. Info about goodie bag and spot prize sponsors to be added soon!